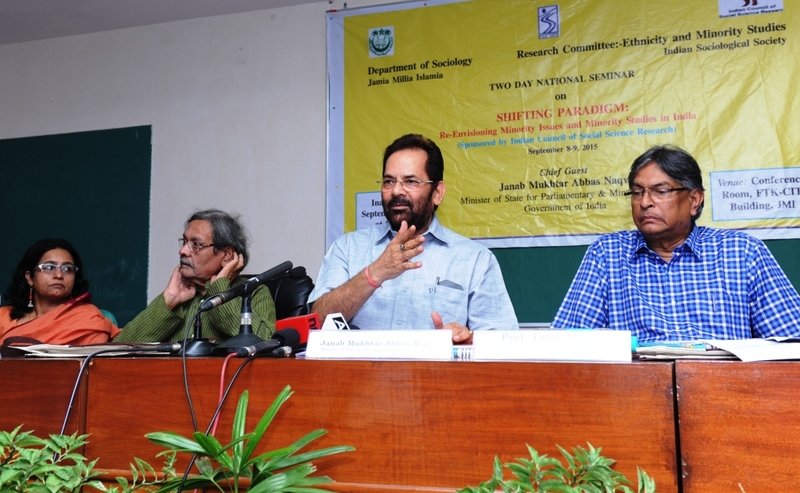 Delivering an Inaugural Address at the National Seminar on ‘Shifting Paradigm: Re-Envisioning Minority Issues and Minority Studies in India’, Shri Mukhtar Abbas Naqvi, Minister of State for Parliamentary and Minority Affairs said that NDA-II Government is committed to change socio-economic environment in the country to promote security and inclusive growth. The overwhelming mandate obtained by the NDA established beyond doubt that young India has sought both systemic change and elimination of stereotypes. He talked about the need to empower minorities politically so that they could become agents of change. Prof. Imtiyaz Ahmad, an eminent Political Scientist and formerly at Jawaharlal Nehru University, giving his Keynote Address, talked about how a democratic state, which was a distributor of rights, could provide insurance for survival and sustenance of the subordinate groups for want of which market forces would bring about their marginalization and exclusion. The progress of subordinate groups cannot be realized by mere dependence on market forces, he elaborated. He felt that the rights enjoyed by minorities in a democratic set-up can be fully realized only if the state chooses not to abdicate its responsibilities. He went on to add that minorities should move away from identity-politics and get themselves mobilized in respect of socio-economic issues. Talking about the strengths of Indian Islam, he said that it was informed by eclecticism, diversity and tolerance and felt that promotion of democracy, moderation and economic development by the state since Independence had instilled confidence even amongst minorities who realized that despite being subordinate groups they could exercise their rights. It was important, he observed, to prevent erosion of confidence that has got built assiduously over years. Prof. T.K. Oommen, Professor Emeritus, Jawaharlal Nehru University, delivering his Keynote Address, presented the need to evolve a social morphology of minorities to understand and promote issues of equity, identity, security and dignity that stood intertwined and intersected. He felt that it was important to bring about a socio-economic environment wherein issues of equity and dignity could be addressed in concrete terms. Prof. Talat Ahmad, giving his Presidential Remarks, said that there was diversity in the country which could be best upheld by the state. It was important to bring education to all the diverse groups in the country that could lead to social democratization, he said. He averred that the efforts of the political leadership to bring about economic growth and prosperity would help address the real issues that confront the nation. State policy formulations should not only be informed my economic and legal inputs but also sociological, he added. Earlier, Dr. Arvinder A Ansari, Organizing Secretary of the Seminar, presented the theme of the seminar. Later, Dr. Neshat Quaiser, Head, Department of Sociology, JMI gave his concluding remarks.